In Palestine, the Return March is emerging, and Israel is killing the demonstrators. Three thousand occupation soldiers deployed in the vicinity of the Gaza Strip with orders to fire live bullets. Thousands of Palestinians marched Friday near the border between Gaza and Israel in a protest march called the Return March, while clashes broke out with the Israeli occupation forces, killing seven Palestinians and injuring hundreds. Tens of thousands of Palestinians went to predetermined points at the center of refugee camps and camps near the Gaza border with Israel at the invitation of the Supreme National Authority for the Great March of Refugees. 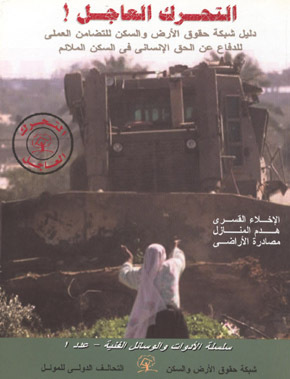 On the other side of the border, Israeli forces placed their tanks and snipers stationed on dirt screens. Soldiers used tear gas towards the youths who approached the fence. According to the correspondent Al Arabiya that 3 thousand soldiers from the occupation forces deployed in the vicinity of the Gaza Strip. Seven Palestinians were killed Friday, according to the Palestinian Ministry of Health, during the protests with the revival of the Palestinian Day of the Land (30 March). The Palestinian Red Crescent Society said that our crews were transferred to hospitals 54 injuries by the Israeli army living from the Gaza Strip. There are other teams from the Ministry of Health and Medical Services carrying countless injuries to Gaza hospitals, she said, adding that dozens of people were injured by tear gas. Palestinians erected hundreds of tents hundreds of meters away from the border between the Gaza Strip and Israel. The Supreme National Authority for the Great March, which includes Hamas, factions and refugee representatives, established 10 large tents in five locations along the Gaza-Israel border, while dozens of small tents were set up by families. Israeli Chief of Staff Gadi Eisenkot was present at the border with Gaza on Friday. He had warned, on Wednesday, that Israeli soldiers would fire if the Palestinians approached the border and posed a danger, according to a statement. 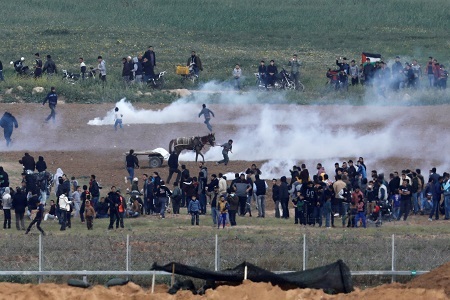 New York—Palestine’s UN ambassador said 17 people - including children under the age of 16 - have been killed in clashes with Israeli soldiers near the Gaza Strip border, where tens of thousands marched in the name of Palestinian refugees and their descendants. Palestine considers Israel‘s actions a huge massacre against our people, Riyad Mansour told reporters in New York ahead of a Security Council meeting called by Kuwait. Mansour called on the Security Council to take action and deal seriously with the issue of providing protection for the civilian population in Gaza. Photo: The occupation suppresses the demonstrators in Gaza on Earth Day 2018. Source: al-Arabiya newspaper.